ANY GUESSES TODAY?? | A.B.E. Remodeling, INC.
NATIONAL AMERICAN BEER DAY National American Beer Day is observed annually by beer drinkers across the nation celebrate on October 27. There are more than 2,100 breweries that manufacture beer in the United States. They range in size from industry giants to brew pubs and microbreweries. o The U.S. produced 196 million barrels of beer in 2009.
o The U.S. consumes roughly 20 US gallons of beer per capita annually. o In 2008, the United States was ranked sixteenth in the world in per capita consumption, while total consumption was second only to China. o Prohibition in the early twentieth century caused nearly all American breweries to close. o After prohibition was repealed the industry had consolidated into a small number of large-scale breweries. o The majority of the new breweries in the U.S. are small breweries and brewpubs, who, as members of the Brewers Association, are termed "craft breweries" to differentiate them from the larger and older breweries. o The most common style of beer produced by the big breweries is American lager. o Most of the smaller breweries, which were founded in the 1980?s, produce a range of styles. American pale ale, Pennsylvania porter, American IPA, steam beer, amber ale, cream ale and Cascadian dark ale. 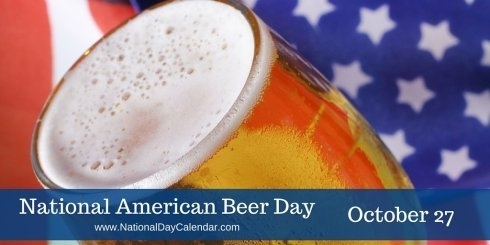 OBSERVE To celebrate National American Beer Day, enjoy your favorite American Beer. Remember to always drink responsibly and to never drink and drive. Use #AmericanBeerDay to post on social media. HISTORY Our research was unable to find the creator and the origin of National American Beer Day. .......and now you have the rights to enjoy a beer today. Just our sharing a post for today. Enjoy the simple things in life. AND WHAT IS YOUR FAVORITE """"BREWSKY"""" (As for me-I don't so much like beer). PS; By the way, it is also Tim's birthday today so if ya see him...wish him a good one. !